One of the saddest and most paradoxical artistic exiles of the 20th century was Sergei Rachmaninoff, who fled the Russian Revolution and wound up in New York and Los Angeles, in equal measure celebrated and obscure. Rachmaninoff (1873-1943) left Moscow a composer and conductor of high consequence who also played the piano. Yet in America he barely conducted and his compositional output plummeted. To earn a living, he turned himself into a keyboard virtuoso of singular fame and attainment—a late embodiment of the heroic Romantic piano lineage beginning with Franz Liszt. Offstage, he retained a lonely Russian home and Russian customs. His severe crewcut and gimlet eyes disclosed little to the world at large. His personal poise was awesome and implacable. Rachmaninoff’s privacy took other forms. He refused permission to have his concerts broadcast, effectively preventing any documentation of what he sounded like in live performance. Instead, he recorded extensively for RCA. But, absent the oxygen a body of listeners can activate, those readings are as celebrated for their emotional control as for their sovereign interpretive mastery. They enshrine kaleidoscopic miracles of color and texture wedded to a vice-like command of musical structure. But the cap remains on the bottle. No longer. A decade ago, a researcher was browsing a collection left by the conductor Eugene Ormandy to the University of Pennsylvania—and read: “33 1/3:12/21/40: Symphonic Dances…Rachmaninoff in person playing the piano.” That is: Ormandy had privately recorded Rachmaninoff playing through his “Symphonic Dances” prior to Ormandy’s premiere performance with the Philadelphia Orchestra in January 1941. This turned out to be no morsel, but 26 minutes of a 35-minute composition. And it’s now embedded in a three-CD Marston set titled “Rachmaninoff Plays Symphonic Dances.” The result is one of the most searing listening experiences in the history of recorded sound. Most of the best piano recordings are made in concert. They’re not as perfect as studio products, but by and large they’re more spontaneous, more intense, more creative. Vladimir Horowitz, an intimate friend, claimed that only one of Rachmaninoff’s commercial recordings—that of the second movement of his own First Concerto, recorded in 1939-40—gave a fair impression. If you listen to that recording, you’ll easily ascertain what Horowitz was talking about—the opening solo is untethered. As privately imparted to Ormandy, Rachmaninoff’s impromptu solo-piano rendering of his “Symphonic Dances” documents roaring cataracts of sound, massive chording, and pounding accents powered by a demonic thrust the likes of which no studio environment has ever fostered. Rachmaninoff’s humbling presence, re-encountered, is gigantic, cyclopean. But the work’s most poignant moment comes in the first movement coda, which cites and pacifies the “vengeance” motto of the confessional First Symphony, a youthful effusion Rachmaninoff discarded following its disastrous 1897 premiere. It is music as naked as the nostalgic Rachmaninoff of the Second Piano Concerto is decorous: a baring of the soul. The First Symphony was completely unknown in 1940 (only in 1944 was a set of parts discovered). And so Rachmaninoff’s allusion in the “Symphonic Dances” is a soul-baring even more private than his piano-rehearsal with Ormandy. In terms of his creative odyssey—his exile and accommodation in a strange land—it is nothing less than a closing of the circle. How does Rachmaninoff himself perform this secret passage, the meaning of which was his alone? Very slowly, lingeringly. Even more affecting is his treatment of the movement’s second subject, a long saxophone melody he invests with a heaving surge and ebb of feeling, imparting a trembling undertow of anguish, of memories faraway and yet unresolved. The second movement waltz, under Rachmaninoff’s fingers, is an essay in macabre shadow-play. The final dance is primal. The work emerges as an iconic leavetaking as bittersweet as any Mahler Abschied. I own a 10-volume 1954 edition of “Grove’s Dictionary of Music” that allots to “Rakhmaninov” less than a page. 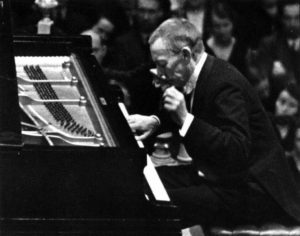 It contains the sentence: “The enormous popular success some few of [his] works had in his lifetime is not likely to last, and musicians never regarded it with much favour.” Today that sentiment is as forgettable as Rachmaninoff is imperishable. The little box containing these Rachmaninoff memories within memories includes other rarities. I cannot imagine a better introduction to this artist at his true worth. It stands as a rebuke to the slickness that often passes for Rachmaninoff interpretation nowadays. More than a lost art, it documents a lost world. Thank You Joe for your sensitive and brilliant illumination of the great Master and indeed…and Incredible performance !!! Thank you for this, its a really fundamental contribution to the knowledge of the “real” Rachmaninoff! My heart is beating with excited anticipation. I love Symphonic Dances.